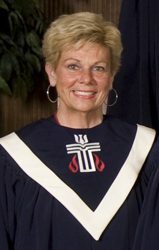 Melinda has enjoyed a successful career in Community Unit School District 200 music education for 33 years, and for the past 34 years has directed and accompanied adult, youth, and handbell choirs and instrumental ensembles in several churches in McHenry County. She has been extensively involved in the professional work of The Delta Kappa Gamma Society International for key women educators, serving the organization in many local chapter and state positions while presenting music and leadership workshops. The Children’s choir rehearses from September until April. Contact Melinda Davis (815-455-3570) or (lynfdavis@aol.com) if you have any questions. Voices of Faith Choir sing a wide range of songs and anthems. Directed by Melinda Davis, choir rehearsal is on Wednesday nights at 7:30p.m. The choir is a multi-generational choir with voices of all ages and ranges. New members are always welcome to add their voice in song and praise to God. Voices of Faith 3 Sundays of the month during the 10:30 am service. Our Sunday School children also participate in music for the last 15 minutes of class. They are learning a variety of music and will participate in worship occasionally. Children’s Sunday School will present the Children’s Christmas program in December.